Every society has its hero myths, but the superhero comic began as a uniquely American phenomenon. Superman, the first of his kind, debuted in 1938 and within a year, his adventures sold a million copies per issue. Since then, these larger-than-life figures have become fixtures in nearly every aspect of American popular culture, from top-rated radio serials to Saturday morning cartoons and even Broadway musicals. In the last few years, superheroes have starred in some of Hollywood’s top-grossing films, with Superman returning in this summer’s blockbuster. But while they’ve become mainstream and ubiquitous American icons, superheroes started as the Depressionera creations of young, second-generation Jewish writers and artists. At a time when most illustration jobs were closed to Jews, comic books publishers (many Jewish themselves) were more than willing to hire them and give them creative freedom. So the majority of 1930’s and 1940’s superhero comics had Jewish creators, including Jerry Siegel and Joe Shuster (Superman), Bob Kane and Bill Finger (Batman), Will Eisner (the Spirit), editor Julius Schwartz (the Flash), Martin Nodell (Green Lantern), and Jack Kirby and Joe Simon (Captain America). While none of these characters were explicitly Jewish, Rabbi Simcha Weinstein argues their creators subconsciously infused these all-American heroes with their own cultural experiences and values. 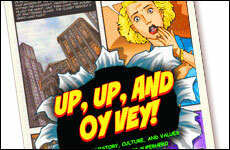 In his new book “Up, Up and Oy Vey!”, Weinstein looks at Jewish themes in the stories of some of America’s most popular superheroes. Weinstein’s first chapter is devoted to Superman, the ultimate fighter for “truth, justice and the American way.” Superman started out as a baby sent to Earth from the doomed planet Krypton. Once he landed safely, the alien child grew up in a Kansas farm community, adopting the guise of nebbish Clark Kent in an attempt to fit in. Consciously or not, this seemed to reflect the experience of his co-creators, both the children of Jewish immigrants from Eastern Europe who faced their own assimilation issues. Superman’s origin story has strong biblical themes, as Moses was similarly saved as an infant when his mother sent him down the Nile and into the arms of an adoptive family with whom he didn’t quite mesh. Even Superman’s Kryptonian name, Kal-El, has a Jewish connection (as Weinstein—and many others— note, it sounds an awful lot like the Hebrew for “voice of God”). Much as the legendary Golem fought off antisemitic mobs in a Prague ghetto, these new heroes and their Jewish creators set to work fighting the growing evil of Nazism. In the late 1930’s, the majority of Americans favored isolationism, and real-life “American heroes,” such as Charles Lindbergh and Henry Ford, openly supported Hitler. But by 1939, Superman found himself rescuing Lois Lane in a “thinly disguised” version of Hitler’s Germany. Two years later, he entered a sports festival in fascist “Dukalia” and, in a clear nod to Jesse Owens’ triumph at the 1936 Berlin Olympics, defeats the “perfect” blond-haired, blue-eyed athletes on their own field. Captain America was even less subtle. On the cover of his first issue, he was depicted punching Hitler squarely in the face—nine months before his namesake declared war on Germany. That Jewish writers crafted these heroes was not lost on the Nazis and their supporters. The pro-Hitler German- American Bund sent death threats and hate mail to Timely Comics (later Marvel), which published Captain America. And in April 1940, Nazi propaganda minister Josef Goebbels devoted space in the SS newspaper to denounce Superman, calling Siegel an “inventive Israelite,” an “intellectually and physically circumcised chap” and a “Sadduccee” who would do anything for money. Americans clearly felt differently. They embraced these characters, and during World War II, comic books made up about 25 percent of all magazines sent to U.S. military personnel overseas. Throughout his book, in which he devotes each chapter to a different superhero or team, Weinstein demonstrates how the genre’s Jewish roots eventually began to show openly in the comics themselves. As a new generation of Jewish writers and artists took hold of the storylines—and as antisemitism became less prevalent in America—some characters “came out” as Jewish while others simply paid homage to their reallife forefathers. For example, in 1961, Stan Lee and Jack Kirby (born Stan Lieber and Jacob Kurtzberg, respectively) gave the Fantastic Four’s orange-rock powerhouse, the Thing, the vaguely Jewish name Benjamin Jacob Grimm and a rough-and-tumble childhood on the largely Jewish Lower East Side of Manhattan. Lee says he never thought about the character’s religion, but in 2002, a new (and non-Jewish) editorial team crafted a backstory in which the Thing said the Shema for a pawnshop owner from his old neighborhood and returned a Star of David he stole as a child. The shopkeeper gently admonished the Thing for never discussing his religion publicly, wondering aloud whether he was ashamed of it. In 1981, Marvel comics sent the Incredible Hulk to Tel Aviv, where he encountered a new character named Sabra—an Israeli policewoman with her own secret identity and superpowers who later appeared in other Marvel titles. Also in the 1980’s, Captain America had a Jewish girlfriend, the Atom taught the rest of the Justice League about the meaning of Chanukah and the X-Men series welcomed the new character Kitty Pryde—a religious granddaughter of a Holocaust survivor. Perhaps the most powerful example of a character’s Jewish heritage ironically comes in the form of a villain. Lee and Kirby’s X-Men series focused on an entire race of mutant heroes persecuted by the “normal” masses. As Weinstein notes, fans have viewed the mutants as metaphors for Jews, homosexuals, African Americans and others seen as “different” in America. And, in a dichotomy familiar to most civil-rights movements, the series set up a central conflict between mutants working toward peaceful coexistence and those determined to fight back. The latter group was led by Magneto who, after years of hints, was revealed as a Holocaust survivor in 1978 by writer Chris Claremont. “I endured one death camp,” Magneto said in that issue, “I will not see another people fear what they do not understand and destroy what they fear.” Immediately, Magneto moved from villain to complex antihero and, in a later story, he teamed with the “good guys” to thwart a right-wing reverend’s goal of a Mutant Registration Act that had an eerie resemblance to the Nazis’ Nuremberg laws. At certain points, Weinstein’s Jewish parallels can come across as reaches. For example, he argues that a biblical proverb stressing the value of partnership directly relates to Batman’s addition of Robin— which had more to do with publishers wanting a character with whom younger readers could identify. And while concepts like justice and family are clearly important in Judaism, they aren’t specifically Jewish enough to count as obvious religious influences, as Weinstein cites them, in the creation of Batman and the Fantastic Four, respectively. Still, the majority of his examples make a convincing case for a Jewish flavor to the genre, and he writes with a conversational tone and an obvious enthusiasm for the subject matter. His book gives an interesting historical overview of a major Jewish addition to popular culture, which opened the door to later comics milestones like Eisner’s groundbreaking graphic novel “A Contract with God” and Art Spiegelman’s Pulitzer-winning “Maus: A Survivor’s Tale.” And with the success of superhero movies like Spiderman, XMen and Superman Returns —featuring Jewish directors such as Sam Raimi and Bryan Singer—it’s a contribution that keeps evolving. Jeff Fleischer is a Chicago-based journalist who has written regularly for publications including the Sydney Morning Herald, Mother Jones, the Chicago Daily Herald and Mental Floss.